To construct exceptional exhaust systems, we start with the right tools: The BSI machine shop features sophisticated CNC routers and our state-of-the-art CNC robot welder, which leaves our team equipped to customize every BSI vent hood and drip shield in house. Because properly functioning exhaust work is critical to the health of your crew, our crew leaves nothing to chance. 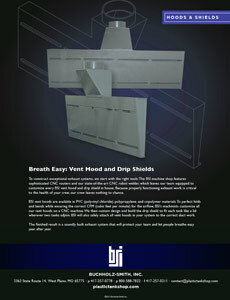 BSI vent hoods are available in PVC (polyvinyl chloride), polypropylene, and copolymer materials. To perfect folds and bends while ensuring the correct CFM (cubic feet per minute) for the airflow, BSI’s machinists customize all our vent hoods on a CNC machine. We then custom design and build the drip shield to fit each tank like a lid wherever two tanks adjoin. BSI will also safely attach all vent hoods in your system to the correct duct work. The finished result is a soundly built exhaust system that will protect your team and let people breathe easy year after year.